This article is about the modern games. For the ancient Greek games, see Ancient Olympic Games. For the 1927 Our Gang short, see Olympic Games (film). For the covert campaign, see Operation Olympic Games. “Olympics” redirects here. For other uses, see Olympic (disambiguation). The modern Olympic Games or Olympics (French: Jeux olympiques) are the leading international sporting event featuring summer and winter sports competitions in which thousands of athletes from around the world participate in a variety of competitions. The Olympic Games are considered to be the world’s foremost sports competition with more than 200 nations participating.The Olympic Games are held every four years, with the Summer and Winter Games alternating by occurring every four years but two years apart. Their creation was inspired by the ancient Olympic Games, which were held inOlympia, Greece, from the 8th century BC to the 4th century AD. Baron Pierre de Coubertin founded the International Olympic Committee (IOC) in 1894. The IOC is the governing body of the Olympic Movement, with the Olympic Charterdefining its structure and authority. The evolution of the Olympic Movement during the 20th and 21st centuries has resulted in several changes to the Olympic Games. Some of these adjustments include the creation of the Winter Olympic Games for ice and winter sports, theParalympic Games for athletes with a disability, and the Youth Olympic Gamesfor teenage athletes. The IOC has had to adapt to a variety of economic, political, and technological advancements. As a result, the Olympics has shifted away from pure amateurism, as envisioned by Coubertin, to allowing participation of professional athletes. The growing importance of mass media created the issue of corporate sponsorship and commercialization of the Games. World wars led to the cancellation of the 1916, 1940, and 1944 Games. Large boycotts during the Cold War limited participation in the 1980 and 1984 Games. The Ancient Olympic Games were religious and athletic festivals held every four years at the sanctuary of Zeus in Olympia, Greece. Competition was among representatives of several city-states and kingdoms of Ancient Greece. These Games featured mainly athletic but also combat sports such as wrestling and thepankration, horse and chariot racing events. It has been widely written that during the Games, all conflicts among the participating city-states were postponed until the Games were finished. This cessation of hostilities was known as the Olympic peace or truce. This idea is a modern myth because the Greeks never suspended their wars. The truce did allow those religious pilgrims who were traveling to Olympia to pass through warring territories unmolested because they were protected by Zeus. The origin of the Olympics is shrouded in mystery and legend; one of the most popular myths identifies Heracles and his father Zeus as the progenitors of the Games. According to legend, it was Heracles who first called the Games “Olympic” and established the custom of holding them every four years. The myth continues that after Heracles completed his twelve labors, he built the Olympic Stadium as an honor to Zeus. Following its completion, he walked in a straight line for 200 steps and called this distance a “stadion” (Greek: στάδιον, Latin: stadium, “stage”), which later became a unit of distance. The most widely accepted inception date for the Ancient Olympics is 776 BC; this is based on inscriptions, found at Olympia, listing the winners of a footrace held every four years starting in 776 BC.The Ancient Games featured running events, a pentathlon (consisting of a jumping event, discus and javelin throws, a foot race, and wrestling), boxing, wrestling, pankration, and equestrian events. Tradition has it that Coroebus, a cook from the city of Elis, was the first Olympic champion. The Olympic Games reached their zenith in the 6th and 5th centuries BC, but then gradually declined in importance as theRomans gained power and influence in Greece. While there is no scholarly consensus as to when the Games officially ended, the most commonly held date is 393 AD, when the emperor Theodosius I decreed that all pagan cults and practices be eliminated. Another date commonly cited is 426 AD, when his successor, Theodosius II, ordered the destruction of all Greek temples. Various uses of the term “Olympic” to describe athletic events in the modern era have been documented since the 17th century. The first such event was the Cotswold Games or “Cotswold Olimpick Games”, an annual meeting near Chipping Campden, England, involving various sports. It was first organized by the lawyer Robert Dover between 1612 and 1642, with several later celebrations leading up to the present day. The British Olympic Association, in its bid for the 2012 Olympic Games in London, mentioned these games as “the first stirrings of Britain’s Olympic beginnings”. L’Olympiade de la République, a national Olympic festival held annually from 1796 to 1798 in Revolutionary France also attempted to emulate the ancient Olympic Games. The competition included several disciplines from the ancient Greek Olympics. The 1796 Games also marked the introduction of the metric system into sport. In 1850 an Olympian Class was started by William Penny Brookes at Much Wenlock, inShropshire, England. In 1859, Brookes changed the name to the Wenlock Olympian Games. This annual sports festival continues to this day. The Wenlock Olympian Society was founded by Brookes on 15 November 1860. Between 1862 and 1867, Liverpool held an annual Grand Olympic Festival. Devised by John Hulley and Charles Melly, these games were the first to be wholly amateur in nature and international in outlook, although only ‘gentlemen amateurs’ could compete. The programme of the first modern Olympiad in Athens in 1896 was almost identical to that of the Liverpool Olympics. In 1865 Hulley, Brookes and E.G. Ravenstein founded the National Olympian Association in Liverpool, a forerunner of the British Olympic Association. Its articles of foundation provided the framework for theInternational Olympic Charter. In 1866, a national Olympic Games in Great Britain was organized at London’s Crystal Palace. Greek interest in reviving the Olympic Games began with the Greek War of Independencefrom the Ottoman Empire in 1821. It was first proposed by poet and newspaper editorPanagiotis Soutsos in his poem “Dialogue of the Dead”, published in 1833. Evangelos Zappas, a wealthy Greek-Romanian philanthropist, first wrote to King Otto of Greece, in 1856, offering to fund a permanent revival of the Olympic Games. Zappas sponsored the first Olympic Games in 1859, which was held in an Athens city square. Athletes participated from Greece and the Ottoman Empire. Zappas funded the restoration of the ancientPanathenaic Stadium so that it could host all future Olympic Games. The stadium hosted Olympics in 1870 and 1875. Thirty thousand spectators attended that Games in 1870, though no official attendance records are available for the 1875 Games. In 1890, after attending the Olympian Games of the Wenlock Olympian Society, Baron Pierre de Coubertin was inspired to found the International Olympic Committee(IOC). Coubertin built on the ideas and work of Brookes and Zappas with the aim of establishing internationally rotating Olympic Games that would occur every four years. He presented these ideas during the first Olympic Congress of the newly created International Olympic Committee. This meeting was held from 16 to 23 June 1894, at the University of Paris. On the last day of the Congress, it was decided that the first Olympic Games to come under the auspices of the IOC would take place in Athens in 1896. The IOC elected the Greek writer Demetrius Vikelas as its first president. The opening ceremony in thePanathinaiko Stadium. The first Games held under the auspices of the IOC was hosted in the Panathenaic Stadium in Athens in 1896. The Games brought together 14 nations and 241 athletes who competed in 43 events. Zappas and his cousin Konstantinos Zappashad left the Greek government a trust to fund future Olympic Games. This trust was used to help finance the 1896 Games. George Averoff contributed generously for the refurbishment of the stadium in preparation for the Games.The Greek government also provided funding, which was expected to be recouped through the sale of tickets and from the sale of the first Olympic commemorative stamp set. After the success of the 1896 Games, the Olympics entered a period of stagnation that threatened their survival. The Olympic Games held at the Paris Exposition in 1900 and the World’s fair at St. Louis in 1904 were side shows. The Games in Paris did not have a stadium, but were notable for being the first time women took part in the Games. When the St. Louis Games were celebrated roughly 650 athletes participated, but 580 were from the United States. The homogeneous nature of these celebrations was a low point for the Olympic Movement. The Games rebounded when the 1906 Intercalated Games (so-called because they were the second Games held within the third Olympiad) were held in Athens. These Games were, but are not now, officially recognized by the IOC and no Intercalated Games have been held since. The Games attracted a broad international field of participants and generated great public interest. This marked the beginning of a rise in both the popularity and the size of the Olympics. An ice hockey game during the1928 Winter Olympics at St. Moritz. The Winter Olympics was created to feature snow and ice sports that were logistically impossible to hold during the Summer Games. Figure skating (in 1908 and 1920) and ice hockey (in 1920) were featured as Olympic events at the Summer Olympics. The IOC desired to expand this list of sports to encompass other winter activities. At the1921 Olympic Congress in Lausanne, it was decided to hold a winter version of the Olympic Games. A winter sports week (it was actually 11 days) was held in 1924 inChamonix, France, in connection with the Paris Games held three months later; this event became the first Winter Olympic Games. Although it was intended that the same country host both the Winter and Summer Games in a given year, this idea was quickly abandoned. The IOC mandated that the Winter Games be celebrated every four years on the same year as their summer counterpart. This tradition was upheld until the 1992 Games in Albertville, France; after that, beginning with the 1994 Games, the Winter Olympics were held every four years, two years after each Summer Olympics. The IOC allowed the formation of National Olympic Committees representing nations that did not meet the strict requirements for political sovereignty that other international organizations demand. As a result, colonies and dependencies are permitted to compete at Olympic Games. Examples of this include territories such as Puerto Rico, Bermuda, and Hong Kong, all of which compete as separate nations despite being legally a part of another country. The current version of the Charter allows for the establishment of new National Olympic Committees to represent nations which qualify as “an independent State recognized by the international community”. Therefore, it did not allow the formation of National Olympic Committees for Sint Maarten and Curaçao when they gained the same constitutional status as Aruba in 2010, although the IOC had recognized the Aruban Olympic Committee in 1986. After 2012, Netherlands Antilles athletes can choose to represent either the Netherlands or Aruba. Many economists are skeptical about the economic benefits of hosting the Olympic Games, emphasizing that such “mega-events” often have large costs while yielding relatively few tangible benefits in the long run. Conversely hosting (or even bidding for) the Olympics appears to increase the host country’s exports, as the host or candidate country sends a signal about trade openness when bidding to host the Games. Moreover, research suggests that hosting the Summer Olympics has a strong positive effect on the philanthropic contributions of corporations headquartered in the host city, which seems to benefit the local nonprofit sector. This positive effect begins in the years leading up to the Games and might persist for several years afterwards, although not permanently. This finding suggests that hosting the Olympics might create opportunities for cities to influence local corporations in ways that benefit the local nonprofit sector and civil society. The Games have also had significant negative effects on host communities; for example, the Centre on Housing Rights and Evictions reports that the Olympics displaced more than two million people over two decades, often disproportionately affecting disadvantaged groups. The 2014 Winter Olympics in Sochi were the most expensive Olympic Games in history, costing in excess of US$50 billion. According to a report by the European Bank for Reconstruction and Development that was released at the time of the games, this cost will not boost Russia’s national economy, but may attract business to Sochi and the southern Krasnodar region of Russia in the future as a result of improved services. But by December 2014, The Guardian stated that Sochi “now feels like a ghost town”, citing the spread-out nature of the stadiums and arenas, the still-unfinished construction, and the overall effects Russia’s political and economic turmoil. Furthermore, at least four cities withdrew their bids for the 2022 Winter Olympics, citing the high costs or the lack of local support, resulting in only a two-city race between Almaty, Kazakhstan and Beijing, China. Thus in July 2016, The Guardian stated that the biggest threat to the future of the Olympics is that very few cities want to host them. The IOC has often been criticized for being an intractable organization, with several members on the committee for life. The presidential terms of Avery Brundage and Juan Antonio Samaranch were especially controversial. Brundage was president for over 20 years, and during his tenure he protected the Olympics from political involvement and the influence of advertising. He was accused of both racism, for his handling of the apartheid issue with the South African delegation, andantisemitism. Under the Samaranch presidency, the office was accused of both nepotism and corruption. Samaranch’s ties with the Franco regime in Spain were also a source of criticism. A BBC documentary entitled Panorama: Buying the Games, aired in August 2004, investigated the taking of bribes in the bidding process for the 2012 Summer Olympics. The documentary claimed it was possible to bribe IOC members into voting for a particular candidate city. After being narrowly defeated in their bid for the 2012 Summer Games, Parisian mayor Bertrand Delanoë specifically accused the British prime minister Tony Blair and the London Bid Committee (headed by former Olympic champion Sebastian Coe) of breaking the bid rules. He cited French president Jacques Chirac as a witness; Chirac gave guarded interviews regarding his involvement. The allegation was never fully explored. The Turinbid for the 2006 Winter Olympics was also shrouded in controversy. A prominent IOC member, Marc Hodler, strongly connected with the rival bid of Sion, Switzerland, alleged bribery of IOC officials by members of the Turin Organizing Committee. These accusations led to a wide-ranging investigation. The allegations also served to sour many IOC members against Sion’s bid and potentially helped Turin to capture the host city nomination. The Olympics have been commercialized to various degrees since the initial 1896 Summer Olympics in Athens, when a number of companies paid for advertizing, including Kodak. In 1908, Oxo, Odol mouthwash and Indian Foot Powder became official sponsors of the London Olympic Games. Coca Cola sponsored the 1928 Summer Olympics, and has subsequently remained a sponsor to the current time. Before the IOC took control of sponsorship, national organizing committees were responsible for negotiating their own contracts for sponsorship and the use of the Olympic symbols. During the first half of the 20th century the IOC ran on a small budget. As president of the IOC from 1952 to 1972, Avery Brundage rejected all attempts to link the Olympics with commercial interest. Brundage believed the lobby of corporate interests would unduly impact the IOC’s decision-making. Brundage’s resistance to this revenue stream meant the IOC left organizing committees to negotiate their own sponsorship contracts and use the Olympic symbols. When Brundage retired the IOC had US$2 million in assets; eight years later the IOC coffers had swelled to US$45 million. This was primarily due to a shift in ideology toward expansion of the Games through corporate sponsorship and the sale of television rights. When Juan Antonio Samaranch was elected IOC president in 1980 his desire was to make the IOC financially independent. The 1936 Summer Olympics in Berlin were the first Games to be broadcast on television, though only to local audiences. The 1956 Winter Olympics were the first internationally televised Olympic Games, and the following Winter Games had their broadcasting rights sold for the first time to specialized television broadcasting networks—CBS paid US$394,000 for the American rights, and theEuropean Broadcasting Union (EBU) allocated US$660,000. In the following decades the Olympics became one of the ideological fronts of the Cold War. Superpowers jockeyed for political supremacy, and the IOC wanted to take advantage of this heightened interest via the broadcast medium. The sale of broadcast rights enabled the IOC to increase the exposure of the Olympic Games, thereby generating more interest, which in turn created more appeal to advertisers time on television. This cycle allowed the IOC to charge ever-increasing fees for those rights. For example, CBS paid US$375 million for the rights of the 1998 Nagano Games, while NBC spent US$3.5 billion for the broadcast rights of all the Olympic Games from 2000 to 2012. Viewership increased exponentially from the 1960s until the end of the century. This was due to the use of satellites to broadcast live television worldwide in 1964, and the introduction of color television in 1968. Global audience estimates for the 1968 Mexico City Games was 600 million, whereas at the Los Angeles Games of 1984, the audience numbers had increased to 900 million; that number swelled to 3.5 billion by the 1992 Summer Olympics in Barcelona. However, at the2000 Summer Games in Sydney, NBC drew the lowest ratings for any Summer or Winter Olympics since 1968. This was attributed to two factors: one was the increased competition from cable channels, the second was the internet, which was able to display results and video in real time. Television companies were still relying on tape-delayed content, which was becoming outdated in the information era. A drop in ratings meant that television studios had to give away free advertising time. With such high costs charged to broadcast the Games, the added pressure of the internet, and increased competition from cable, the television lobby demanded concessions from the IOC to boost ratings. The IOC responded by making a number of changes to the Olympic program. At the Summer Games, the gymnastics competition was expanded from seven to nine nights, and a Champions Gala was added to draw greater interest. The IOC also expanded the swimming and diving programs, both popular sports with a broad base of television viewers. Finally, the American television lobby, namely NBC, was able to dictate when certain events were held so that they could be broadcast live during prime time in the United States. The results of these efforts were mixed: ratings for the 2006 Winter Games were significantly lower than those for the 2002 Games, while there was a sharp increase in viewership for the 2008 Summer Olympics, and the 2012 Summer Games became the most watched event in US television history. The Olympic motto, Citius, Altius, Fortius, a Latin expression meaning “Faster, Higher, Stronger” was proposed by Pierre de Coubertin in 1894 and has been official since 1924. The motto was coined by Coubertin’s friend, the Dominican priestHenri Didon OP, for a Paris youth gathering of 1891. Months before each Games, the Olympic Flame is lit in Olympia in a ceremony that reflects ancient Greek rituals. A female performer, acting as a priestess, ignites a torch by placing it inside a parabolic mirror which focuses the sun’s rays; she then lights the torch of the first relay bearer, thus initiating the Olympic torch relay that will carry the flame to the host city’s Olympic stadium, where it plays an important role in the opening ceremony. Though the flame has been an Olympic symbol since 1928, the torch relay was only introduced at the 1936 Summer Games. The Olympic mascot, an animal or human figure representing the cultural heritage of the host country, was introduced in1968. It has played an important part of the Games’ identity promotion since the 1980 Summer Olympics, when the Russian bear cub Misha reached international stardom. The mascot of the Summer Olympics in London was named Wenlock after the town of Much Wenlock in Shropshire. Much Wenlock still hosts the Wenlock Olympian Games, which were an inspiration to Pierre de Coubertin for the Olympic Games. A scene from the opening ceremony of the 2012 Summer Olympics inLondon. As mandated by the Olympic Charter, various elements frame the opening ceremony of the Olympic Games. This ceremony takes place before the events have occurred. Most of these rituals were established at the 1920 Summer Olympics in Antwerp. The ceremony typically starts with the hoisting of the host country’s flag and a performance of its national anthem. The host nation then presents artistic displays of music, singing, dance, and theater representative of its culture. The artistic presentations have grown in scale and complexity as successive hosts attempt to provide a ceremony that outlasts its predecessor’s in terms of memorability. The opening ceremony of the Beijing Games reportedly cost $100 million, with much of the cost incurred in the artistic segment. After the artistic portion of the ceremony, the athletes parade into the stadium grouped by nation. Greece is traditionally the first nation to enter in order to honor the origins of the Olympics. Nations then enter the stadium alphabetically according to the host country’s chosen language, with the host country’s athletes being the last to enter. During the 2004 Summer Olympics, which was hosted in Athens, Greece, the Greek flag entered the stadium first, while the Greek delegation entered last. Speeches are given, formally opening the Games. Finally, the Olympic torch is brought into the stadium and passed on until it reaches the final torch carrier, often a successful Olympic athlete from the host nation, who lights the Olympic flame in the stadium’s cauldron. Athletes gather in the stadium during the closing ceremony of the2008 Summer Olympics in Beijing. The closing ceremony of the Olympic Games takes place after all sporting events have concluded. Flag-bearers from each participating country enter the stadium, followed by the athletes who enter together, without any national distinction.Three national flags are hoisted while the corresponding national anthems are played: the flag of the current host country; the flag of Greece, to honor the birthplace of the Olympic Games; and the flag of the country hosting the next Summer or Winter Olympic Games. The president of the organizing committee and the IOC president make their closing speeches, the Games are officially closed, and the Olympic flame is extinguished. In what is known as the Antwerp Ceremony, the mayor of the city that organized the Games transfers a special Olympic flag to the president of the IOC, who then passes it on to the mayor of the city hosting the next Olympic Games. The next host nation then also briefly introduces itself with artistic displays of dance and theater representative of its culture. As is customary, the men’s marathon medals (at the Summer Olympics) or the men’s 50 km cross-country skiing freestyle mass start medals (at the Winter Olympics) are presented as part of the Closing Ceremony, which take place later that day, in the Olympic Stadium, and are thus the last medal presentation of the Games. A medal ceremony with the Danish flag, the Union Jack of the United Kingdom, and the New Zealand flagfrom left to right during the 2008 Summer Olympics. A medal ceremony is held after each Olympic event is concluded. The winner, second and third-place competitors or teams stand on top of a three-tiered rostrum to be awarded their respective medals. After the medals are given out by an IOC member, the national flags of the three medalists are raised while the national anthem of the gold medalist’s country plays. Volunteering citizens of the host country also act as hosts during the medal ceremonies, as they aid the officials who present the medals and act as flag-bearers. The Olympic Games program consists of 35 sports, 30 disciplines and 408 events. For example, wrestling is a Summer Olympic sport, comprising two disciplines:Greco-Roman and Freestyle. It is further broken down into fourteen events for men and four events for women, each representing a different weight class. The Summer Olympics program includes 26 sports, while the Winter Olympics program features 15 sports. Athletics, swimming, fencing, and artistic gymnastics are the only summer sports that have never been absent from the Olympic program. Cross-country skiing, figure skating, ice hockey, Nordic combined, ski jumping, and speed skating have been featured at every Winter Olympics program since its inception in 1924. Current Olympic sports, like badminton, basketball, and volleyball, first appeared on the program asdemonstration sports, and were later promoted to full Olympic sports. Some sports that were featured in earlier Games were later dropped from the program. In October and November 2004, the IOC established an Olympic Programme Commission, which was tasked with reviewing the sports on the Olympic program and all non-Olympic recognized sports. The goal was to apply a systematic approach to establishing the Olympic program for each celebration of the Games. The commission formulated seven criteria to judge whether a sport should be included on the Olympic program. These criteria are history and tradition of the sport, universality, popularity of the sport, image, athletes’ health, development of the International Federation that governs the sport, and costs of holding the sport. From this study five recognized sports emerged as candidates for inclusion at the 2012 Summer Olympics: golf, karate, rugby union, roller sports and squash. These sports were reviewed by the IOC Executive Board and then referred to the General Session in Singapore in July 2005. Of the five sports recommended for inclusion only two were selected as finalists: karate and squash. Neither sport attained the required two-thirds vote and consequently they were not promoted to the Olympic program. In October 2009 the IOC voted to instate golf and rugby union as Olympic sports for the 2016 and 2020 Summer Olympic Games. 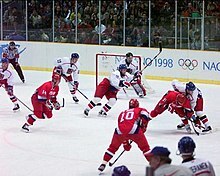 Professional NHL players were allowed to participate in ice hockeystarting in 1998 (1998 Gold medal game between Russia and the Czech Republic pictured). The ethos of the aristocracy as exemplified in the English public school greatly influenced Pierre de Coubertin. The public schools subscribed to the belief that sport formed an important part of education, an attitude summed up in the sayingmens sana in corpore sano, a sound mind in a sound body. In this ethos, a gentleman was one who became an all-rounder, not the best at one specific thing. There was also a prevailing concept of fairness, in which practicing or training was considered tantamount to cheating. Those who practiced a sport professionally were considered to have an unfair advantage over those who practiced it merely as a hobby. As class structure evolved through the 20th century, the definition of the amateur athlete as an aristocratic gentleman became outdated. The advent of the state-sponsored “full-time amateur athlete” of the Eastern Bloc countries further eroded the ideology of the pure amateur, as it put the self-financed amateurs of the Western countries at a disadvantage. Nevertheless, the IOC held to the traditional rules regarding amateurism. Beginning in the 1970s, amateurism requirements were gradually phased out of the Olympic Charter. After the 1988 Games, the IOC decided to make all professional athletes eligible for the Olympics, subject to the approval of the IFs. As of 2012, the only sports in which no professionals compete is boxing and wrestling, although even this requires a definition of amateurism based on fight rules rather than on payment, as some boxers and wrestlers receive cash prizes from their National Olympic Committees. Map showing the countries that boycotted the 1976(yellow), 1980 (blue), and 1984 (red) Summer Olympics. There were three boycotts of the 1956 Melbourne Olympics: theNetherlands, Spain, and Switzerland refused to attend because of the repression of the Hungarian uprising by the Soviet Union, but did send an equestrian delegation to Stockholm; Cambodia,Egypt, Iraq, and Lebanon boycotted the Games because of the Suez Crisis; and China (the “People’s Republic of China”) boycotted the Games because Taiwan was allowed to compete in the Games as the “Republic of China”. In 1972 and 1976 a large number of African countries threatened the IOC with a boycott to force them to ban South Africaand Rhodesia, because of their segregationist regimes. New Zealand was also one of the African boycott targets, becauseits national rugby union team had toured apartheid-ruled South Africa. The IOC conceded in the first two cases, but refused to ban New Zealand on the grounds that rugby was not an Olympic sport. Fulfilling their threat, twenty African countries were joined by Guyana and Iraq in a withdrawal from the Montreal Games, after a few of their athletes had already competed. Taiwan also decided to boycott these Games because the People’s Republic of China (PRC) exerted pressure on the Montreal organizing committee to keep the delegation from the Republic of China (ROC) from competing under that name. The ROC refused a proposed compromise that would have still allowed them to use the ROC flag and anthem as long as the name was changed. Taiwan did not participate again until 1984, when it returned under the name of Chinese Taipei and with a special flag and anthem. In 1980 and 1984, the Cold War opponents boycotted each other’s Games. The United States and sixty-four other countries boycotted the Moscow Olympics in 1980 because of the Soviet invasion of Afghanistan. This boycott reduced the number of nations participating to 81, the lowest number since 1956. The Soviet Union and 15 other nations countered by boycotting the Los Angeles Olympics of 1984, contending that they could not guarantee the safety of their athletes. Soviet officials defended their decision to withdraw from the Games by saying that “chauvinistic sentiments and an anti-Soviet hysteria are being whipped up in the United States”. The boycotting nations of the Eastern Bloc staged their own alternate event, the Friendship Games, in July and August. There had been growing calls for boycotts of Chinese goods and the 2008 Olympics in Beijing in protest of China’s human rights record, and in response to Tibetan disturbances. Ultimately, no nation supported a boycott. In August 2008, the government of Georgia called for a boycott of the 2014 Winter Olympics, set to be held in Sochi, Russia, in response to Russia’s participation in the 2008 South Ossetia war. The Olympic Games have been used as a platform to promote political ideologies almost from its inception. Nazi Germany wished to portray the National Socialist Partyas benevolent and peace-loving when they hosted the 1936 Games, though they used the Games to display Aryan superiority. 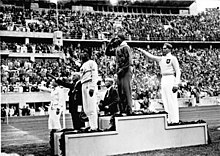 Germany was the most successful nation at the Games, which did much to support their allegations of Aryansupremacy, but notable victories by African American Jesse Owens, who won four gold medals, and Hungarian Jew Ibolya Csák, blunted the message. The Soviet Union did not participate until the 1952 Summer Olympics in Helsinki. Instead, starting in 1928, the Soviets organized an international sports event calledSpartakiads. During the interwar period of the 1920s and 1930s, communist and socialist organizations in several countries, including the United States, attempted to counter what they called the “bourgeois” Olympics with the Workers Olympics. It was not until the 1956 Summer Games that the Soviets emerged as a sporting superpower and, in doing so, took full advantage of the publicity that came with winning at the Olympics. Individual athletes have also used the Olympic stage to promote their own political agenda. At the 1968 Summer Olympics in Mexico City, two American track and field athletes, Tommie Smith and John Carlos, who finished first and third in the 200 meters, performed the Black Power salute on the victory stand. The second-place finisher, Peter Norman of Australia, wore an Olympic Project for Human Rights badge in support of Smith and Carlos. In response to the protest, IOC presidentAvery Brundage told the United States Olympic Committee (USOC) to either send the two athletes home or withdraw the track and field team. The USOC opted for the former. During the same Olympics, Czechoslovakian gymnast Věra Čáslavská announced her protest to the Soviet-led invasion of her home country after controversially receiving Silver on theBeam and a shared Gold on the Floor. During the Soviet anthem, Čáslavská turned her head down and to the right of the Soviet flag in order to make a statement over the invasion and the Soviet influence of the sport of Gymnastics. Returning home, Čáslavská was made an outcast by the Soviet government and was banned from competition and travelling. Thomas Hicks running themarathon at the 1904 Summer Olympics. In the early 20th century, many Olympic athletes began using drugs to improve their athletic abilities. For example, in 1904, Thomas Hicks, a gold medalist in the marathon, was given strychnine by his coach. The only Olympic death linked to performance enhancing occurred at the 1960 Rome games. A Danish cyclist, Knud Enemark Jensen, fell from his bicycle and later died. A coroner’s inquiry found that he was under the influence of amphetamines. By the mid-1960s, sports federations started to ban the use of performance-enhancing drugs; in 1967 the IOC followed suit. The first Olympic athlete to test positive for the use of performance-enhancing drugs was Hans-Gunnar Liljenwall, a Swedish pentathlete at the 1968 Summer Olympics, who lost his bronze medal for alcohol use. One of the most publicized doping-related disqualifications occurred after the1988 Summer Olympics where Canadian sprinter, Ben Johnson (who won the 100-metre dash) tested positive for stanozolol. His gold medal was later stripped and awarded to the American runner-up Carl Lewis, who himself had tested positive for banned substances prior to the Olympics. In 1999 the IOC formed the World Anti-Doping Agency (WADA) in an effort to systematize the research and detection of performance-enhancing drugs. There was a sharp increase in positive drug tests at the 2000 Summer Olympics and 2002 Winter Olympics. Several medalists in weightlifting and cross-country skiing were disqualified because of doping offenses. During the 2006 Winter Olympics, only one athlete failed a drug test and had a medal revoked. The IOC-established drug testing regimen (now known as the Olympic Standard) has set the worldwide benchmark that other sporting federations attempt to emulate. During the Beijing games, 3,667 athletes were tested by the IOC under the auspices of the World Anti-Doping Agency. Both urine and blood tests were used to detect banned substances. Several athletes were barred from competition by their National Olympic Committees prior to the Games; only three athletes failed drug tests while in competition in Beijing. In London over 6,000 Olympic and Paralympic athletes were tested. Prior to the Games 107 athletes tested positive for banned substances and were not allowed to compete. During and after the Games eight athletes tested positive for a banned substance and were suspended, including shot putter Nadzeya Ostapchuk, who was stripped of her gold medal. 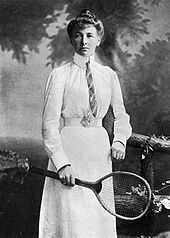 Charlotte Cooper of theUnited Kingdom, first woman Olympic champion, in the1900 Games. Women were first allowed to compete at the 1900 Summer Olympics in Paris, but at the 1992 Summer Olympics 35 countries were still fielding all-male delegations. This number dropped rapidly over the following years. In 2000, Bahrain sent two women competitors for the first time: Fatema Hameed Gerashi and Mariam Mohamed Hadi Al Hilli. In 2004,Robina Muqimyar and Fariba Rezayee became the first women to compete for Afghanistan at the Olympics. In 2008, the United Arab Emirates sent female athletes (Maitha Al Maktoum competed in taekwondo, and Latifa Al Maktoum in equestrian) to the Olympic Games for the first time. Both athletes were from Dubai’s ruling family. By 2010, only three countries had never sent female athletes to the Games: Brunei, Saudi Arabia, and Qatar. Brunei had taken part in only three celebrations of the Games, sending a single athlete on each occasion, but Saudi Arabia and Qatar had been competing regularly with all-male teams. In 2010, the International Olympic Committee announced it would “press” these countries to enable and facilitate the participation of women for the 2012 Summer Olympics. Anita DeFrantz, chair of the IOC’s Women and Sports Commission, suggested that countries be barred if they prevented women from competing. Shortly thereafter, the Qatar Olympic Committee announced that it “hoped to send up to four female athletes in shooting and fencing” to the 2012 Summer Games in London. In 2008, Ali Al-Ahmed, director of the Institute for Gulf Affairs, likewise called for Saudi Arabia to be barred from the Games, describing its ban on women athletes as a violation of the International Olympic Committee charter. He noted: “For the last 15 years, many international nongovernmental organizations worldwide have been trying to lobby the IOC for better enforcement of its own laws banning gender discrimination. […] While their efforts did result in increasing numbers of women Olympians, the IOC has been reluctant to take a strong position and threaten the discriminating countries with suspension or expulsion.” In July 2010, The Independent reported: “Pressure is growing on the International Olympic Committee to kick out Saudi Arabia, who are likely to be the only major nation not to include women in their Olympic team for 2012. […] Should Saudi Arabia […] send a male-only team to London, we understand they will face protests from equal rights and women’s groups which threaten to disrupt the Games”. The only sport on the Olympic programme that features men and women competing together is the equestrian disciplines. There is no “Women’s Eventing”, or ‘Men’s Dressage’. As of 2008, there were still more medal events for men than women. With the addition of women’s boxing to the program in the 2012 Summer Olympics, however, female athletes were able to compete in all the same sports as men. In the winter Olympics, women are still unable to compete in the Nordic Combined. There are currently two Olympic events in which male athletes may not compete: synchronized swimming andrhythmic gymnastics. Three Olympiads had to pass without a celebration of the Games because of war: the 1916 Games were cancelled because of World War I, and the summer and winter games of 1940 and 1944 were cancelled because of World War II. The Russo-Georgian War between Georgia and Russia erupted on the opening day of the 2008 Summer Olympics in Beijing. BothPresident Bush and Prime Minister Putin were attending the Olympics at that time and spoke together about the conflict at a luncheon hosted by Chinese president Hu Jintao. When Nino Salukvadze of Georgia won the bronze medal in the10 metre air pistol competition, she stood on the medal podium with Natalia Paderina, a Russian shooter who had won the silver. In what became a much-publicized event from the Beijing Games, Salukvadze and Paderina embraced on the podium after the ceremony had ended. Terrorism most directly affected the Olympic Games in 1972. When the Summer Games were held in Munich, Germany, eleven members of the Israeli Olympic team were taken hostage by the Palestinian terrorist group Black September in what is now known as the Munich massacre. The terrorists killed two of the athletes soon after they had taken them hostage and killed the other nine during a failed liberation attempt. A German police officer and five terrorists also perished. Terrorism affected the last two Olympic Games held in the United States. During the Summer Olympics in 1996 in Atlanta, Georgia, a bomb was detonated at the Centennial Olympic Park, which killed two and injured 111 others. The bomb was set by Eric Rudolph, an American domestic terrorist, who is currently serving a life sentence for the bombing. The 2002 Winter Olympics in Salt Lake City, Utah, took place just five months after the September 11 attacks, which meant a higher level of security than ever before provided for an Olympic Games. The opening ceremonies of the Games featured symbols of the day’s events. They included the flag that flew at Ground Zero, NYPD officer Daniel Rodríguez singing “God Bless America“, and honor guards of NYPD and FDNY members. The events of that day have made security at the Olympic Games an increasing concern for Olympic planners. The Olympic Games have been criticized as upholding (and in some cases increasing) the colonial policies and practices of some host nations and cities either in the name of the Olympics by associated parties or directly by official Olympic bodies, such as the International Olympic Committee, host organizing committees and official sponsors. Critics have argued that the Olympics have engaged in or caused: erroneous anthropological and colonial knowledge production; erasure; commodification and appropriation of indigenous ceremonies and symbolism; theft and inappropriate display of indigenous objects; further encroachment on and support of the theft of indigenous lands; and neglect and/or intensification of poor social conditions for indigenous peoples. Such practices have been observed at: the 1904 Summer Olympics in St. Louis, Missouri; the 1976 Summer Olympics in Montreal, Quebec; the 1988 Winter Olympics in Calgary, Alberta; and the2010 Winter Olympics in Vancouver, British Columbia. Other notable examples include Kenyan runner Bernard Lagat, who became a United States citizen in May 2004. The Kenyan constitution requires that one renounce their Kenyan citizenship when they become a citizen of another nation. Lagat competed for Kenya in the 2004 Athens Olympics even though he had already become a United States citizen. According to Kenya, he was no longer a Kenyan citizen, jeopardizing his silver medal. Lagat said he started the citizenship process in late 2003 and did not expect to become an American citizen until after the Athens games. Basketball player Becky Hammon was not being considered for the United States Olympic team but wanted to play in an Olympic Games, so she emigrated to Russia, where she already played in a domestic league during the WNBA offseason. Hammon received criticism from some Americans, including the US national team coach, even being called unpatriotic. As of the 2012 Games in London, all of the current 204 NOCs have participated in at least one edition of the Olympic Summer Olympics, and athletes from Australia, France,[A] Great Britain, Greece, and Switzerland[B] have competed in all twenty-seven Summer Olympic Games. 119 NOCs (110 of the current 204 NOCs and 9 obsolete NOCs) have participated in at least one Winter Games, and twelve nations (Austria, Canada, Finland, France, Great Britain, Hungary, Italy, Norway, Poland, Sweden, Switzerland, and theUnited States) have participated in all twenty-two Winter Games to date. Including continuity from Czechoslovakia, the Czech Republic and Slovakia have also been represented in every edition. The host city for an Olympic Games is usually chosen seven to eight years ahead of their celebration. The process of selection is carried out in two phases that span a two-year period. The prospective host city applies to its country’s National Olympic Committee; if more than one city from the same country submits a proposal to its NOC, the national committee typically holds an internal selection, since only one city per NOC can be presented to the International Olympic Committee for consideration. Once the deadline for submission of proposals by the NOCs is reached, the first phase (Application) begins with the applicant cities asked to complete a questionnaire regarding several key criteria related to the organization of the Olympic Games. In this form, the applicants must give assurances that they will comply with the Olympic Charter and with any other regulations established by the IOC Executive Committee. The evaluation of the filled questionnaires by a specialized group provides the IOC with an overview of each applicant’s project and their potential to host the Games. On the basis of this technical evaluation, the IOC Executive Board selects the applicants that will proceed to the candidature stage. Once the candidate cities are selected, they must submit to the IOC a bigger and more detailed presentation of their project as part of a candidature file. Each city is thoroughly analyzed by an evaluation commission. This commission will also visit the candidate cities, interviewing local officials and inspecting prospective venue sites, and submit a report on its findings one month prior to the IOC’s final decision. During the interview process the candidate city must also guarantee that it will be able to fund the Games. After the work of the evaluation commission, a list of candidates is presented to the General Session of the IOC, which must assemble in a country that does not have a candidate city in the running. The IOC members gathered in the Session have the final vote on the host city. Once elected, the host city bid committee (together with the NOC of the respective country) signs a Host City Contract with the IOC, officially becoming an Olympic host nation and host city. In addition to the United States, nations hosting multiple Winter Games are France with three, while Switzerland, Austria, Norway, Japan, Canada and Italy have hosted twice. Among host cities, Lake Placid, Innsbruck and St. Moritz have played host to the Winter Olympic Games more than once, each holding that honor twice. The most recent Winter Games were held in Sochi in 2014, Russia‘s first Winter Olympics and second Olympics overall.